1U.S. Geological Survey, Reston, VA 20192. 2University of Vermont, Burlington, VT 05405. 3Vermont Geological Survey, Waterbury, VT 05671. 4U.S. Geological Survey, Montpelier, VT 05601. 5U.S. Geological Survey, Denver, CO 80225. 6Wesleyan University, Middletown, CT 06459. The Bedrock Geologic Map of Vermont is the result of a cooperative agreement between the U.S. Geological Survey (USGS) and the State of Vermont. The State’s complex geology spans 1.4 billion years of Earth's history. The new map comes 50 years after the most recent map of the State by Charles G. Doll and others in 1961 and a full 150 years since the publication of the first geologic map of Vermont by Edward Hitchcock and others in 1861. 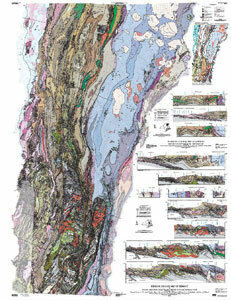 At a scale of 1:100,000, the map shows an uncommon level of detail for State geologic maps. Mapped rock units are primarily based on lithology, or rock type, to facilitate derivative studies in multiple disciplines. The 1961 map was compiled from 1:62,500-scale or smaller maps. The current map was created to integrate more detailed (1:12,000- to 1:24,000-scale) modern and older (1:62,500-scale) mapping with the theory of plate tectonics to provide a framework for geologic, tectonic, economic, hydrogeologic, and environmental characterization of the bedrock of Vermont. The printed map consists of three oversize sheets (52 x 76 inches). Sheets 1 and 2 show the southern and northern halves of Vermont, respectively, and can be trimmed and joined so that the entire State can be displayed as a single entity. These sheets also include 10 cross sections and a geologic structure map. Sheet 3 on the front consists of descriptions of 486 map units, a correlation of map units, and references cited. Sheet 3 on the back features a list of the 195 sources of geologic map data keyed to an index map of 7.5-minute quadrangles in Vermont, as well as a table identifying ages of rocks dated by uranium-lead zircon geochronology. Note on sheet 3: Two PDF files are provided for the front of sheet 3, with two differently sized artboards due to a problem associated with the search and find features in Adobe Acrobat. In the full-size print file (77- x 54-inch artboard) the search and find features do not automatically pan to the proper location, making it difficult to find searched text. Search and find correctly pans in the search file with the smaller artboard (44- x 35-inch artboard), but the document is tiled into six separate pages. The Downloads folder contains Google EarthTM, graphics, Metadata (HTML) and text, Metadata Frequently Anticipated Questions, Metadata.XML, Shape, Symbols, Readme.txt, ArcMap document file, SIM3184.ZIP, SIM3184_nobase.ZIP, and SIM3184GE.ZIP. Consult the Readme.txt file for a full description of these files. Ratcliffe, N.M., Stanley, R.S., Gale, M.H., Thompson, P.J., and Walsh, G.J., 2011, Bedrock geologic map of Vermont: U.S. Geological Survey Scientific Investigations Map 3184, 3 sheets, scale 1:100,000.